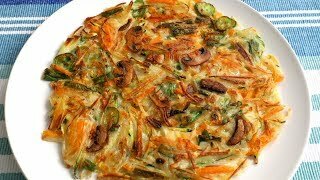 Let’s celebrate the spring of 2018 with yachaejeon, a Korean vegetable pancake! 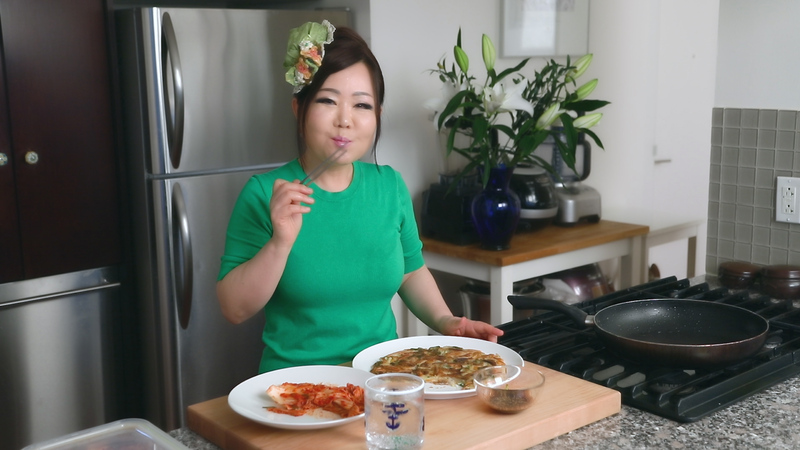 I introduced this recipe to you in 2007 when I first started YouTube, but it wasn’t exactly yachaejeon because I used seafood. The video is here if you’re interested to see it. This time let’s make a real yachaejeon! We’ll use a couple different kinds of vegetables and you can add your own, too. I didn’t use perilla leaves (kkaenip) or asian chives (buchu) this time, but they work well in yachaejeon. Posted on Thursday, August 9th, 2007 at 7:19 am. Last updated on April 17, 2018. Posted March 5th, 2019 at 7:51 pm | Log in to reply. My son and I planned to be vegetarian. The vegetable pancake was our first veggie meal and it is amazing. Posted March 7th, 2019 at 9:36 am | Log in to reply. Posted November 16th, 2018 at 4:02 am | Log in to reply. Great Recipe.. Very healthy and easy to cook.. I added few more ingredients like Kimchi, garlic ginger squash.. This added flavor to this Pancake..
Posted October 23rd, 2018 at 8:20 pm | Log in to reply. We can’t eat grains , can I replace it with any nut flour? Can you suggest quantity – how much should I use and which nut flour ? And for stickiness can I add egg or flax seed meal? Posted July 9th, 2018 at 6:58 pm | Log in to reply. I love your site and all of your recipes. 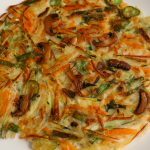 Recently I have been cooking lots of Korean vegetables to keep in the refrigerator for when someone wants a snack or a quick lunch, or when I need to make dinner quickly. I love how well these dishes keep and how most of them are good hot or cold. I have a question about this recipe. I don’t have any nonstick pans: I use cast iron or stainless steel for everything. I wonder what cooking surface was commonly used in Korea before nonstick cookware was invented. I’m guessing possibly well-seasoned cast iron or well-seasoned carbon steel? I’m going to try to make this one in my cast iron skillet, which is what I usually use for pancakes and egg dishes. Thank you again for all of your recipes! Posted July 11th, 2018 at 9:05 am | Log in to reply. I remember a big festival at my grandmother’s house when I was young, she used the lid of her cast iron pot, turned upside down, to make large amounts of pancakes. So I’m sure your cast iron skillet will work well. Posted May 24th, 2018 at 9:52 am | Log in to reply. My sister was cooking Vegetable pancake by your recipe and it was amazing! This recipe was originally posted on August 9, 2007 at 7:19 am by Maangchi. It was last updated on April 17, 2018. The video was watched 1,198,121 times on YouTube & has 37,227 likes! 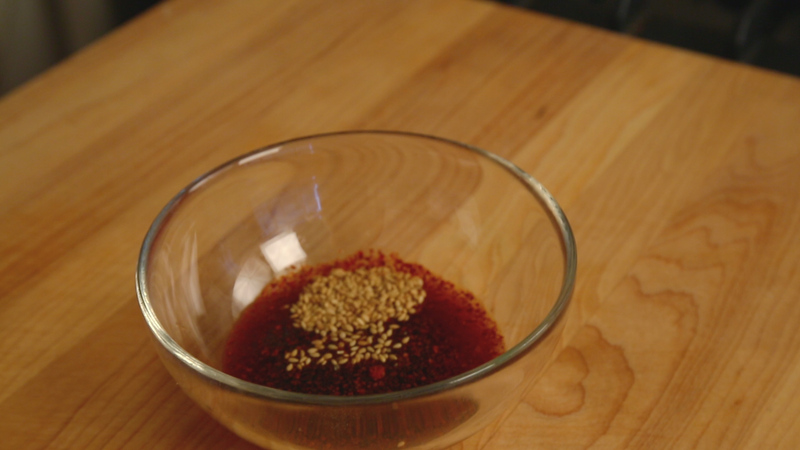 This video is a remade version of an earlier recipe. The original video was posted on 2007-08-09 and has 774,091 views.